It's safe to say that burgundy (or is it oxblood? Wine maybe?) is going to be a part of my fall color palette for forever. When I saw this Bell Sleeve Chiffon dress on Wet Seal's website, that trustworthy light bulb flashed above my head and I thought, "Thanksgiving solved!" Layered with a faux fur vest, it's instant luxe without really any fuss. And if there's one thing I don't want on Turkey Day, it's fuss. The "BELL SLEEVE CHIFFON DRESS" was c/o of Wet Seal. All opinions are my own and were not influenced by the brand. Why does this color have so many names? Ha! Love it paired with the vest. Ain't nobody got time for fuss! This is a great dress on you. Both the style and color are very flattering and the vest totally kicks it up a notch! 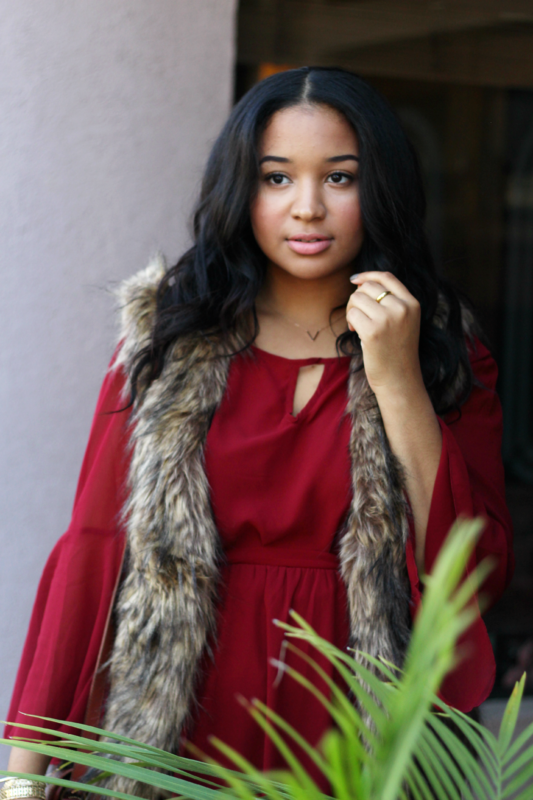 That dress is so pretty and you totally styled it perfectly with those booties and fur vest!! Love the look and love the color of the dress! This is definitely no fuss and perfect for the holidays! I would even rock it with strappy heels for christmas eve! I'm super jealous that you have already figured out your Turkey Day look. You are 98 steps ahead of the game!! Love the color on you and you can never ever go wrong with a fur vest!! Love it Audrey! Um yes!! 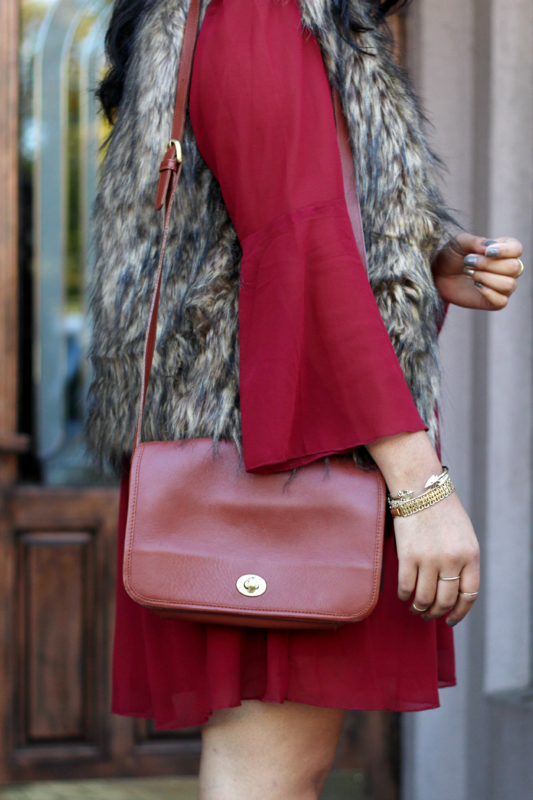 Love the burgundy and fur! Such a perfect thanksgiving outfit! Gorgeous girly! This would be the most gorgeous T-Day outfit! I love the fur layered with the dress. I love those bell sleeves on your dress! so darling! great outfit! IM A SUCKER FOR RED AND FAUX FUR ! 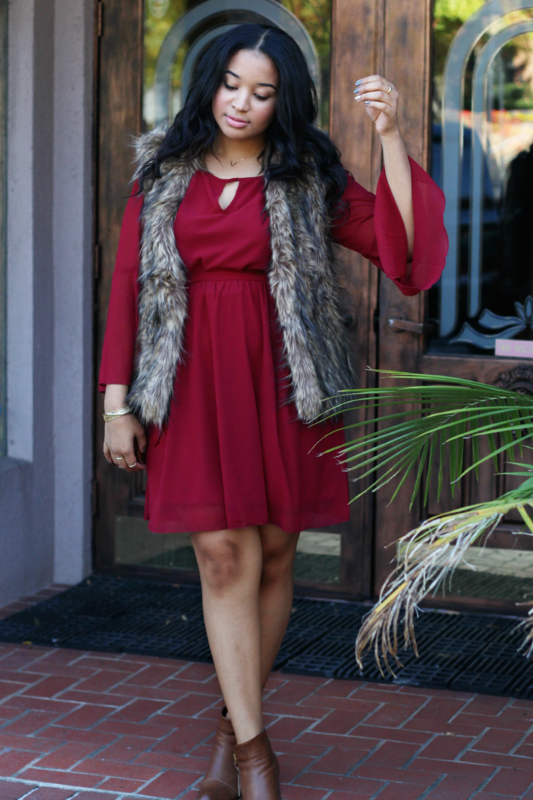 Love this red dress on you and the vest is perfect with it! Oxblood should be a part of your fall wardrobe since this color looks so good on you! The fur vest you paired with it looks so cozy! Wet Seal, wow. Pretty great stuff. So beautiful, love the vest!